Remember in Ghostbusters when Egon says not to cross the streams? Well…. I use the Exceed 2.4 Ghz TX for my RC habit, and so far have been very happy with it… with one small exception: it eats batteries. It seems like (though I have not timed it) that I can get about 5 or so hours of flight time out of a set of 8 AA batteries before the voltage drops too low to reliably control the plane. There is no audible low voltage warning – you just have to pay attention to the single LED on the front of the transmitter. When it starts to go red, its time to land asap. So, today I decided to solder in a lead with a Dean’s connector so that I can plug in one of my LiPo 3 cell 11.1 V batteries that I use for my planes. Things were going great right up until I plugged in the connector the first time… what do you notice about things in this picture? Yup.. 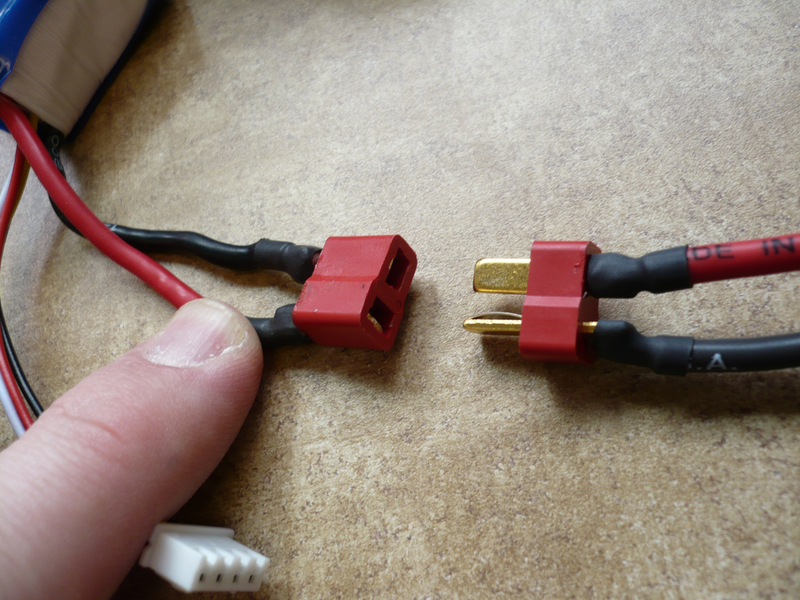 I was in a hurry, and I did not pay attention to the polarity on the male connector that I soldered into the TX … and I mixed up negative and positive. Continuing not to pay attention I plugged the connectors together, thus flooding my poor transmitter with lots of power, but in the wrong direction. less than a second later I heard to loud bangs from inside the transmitter case. 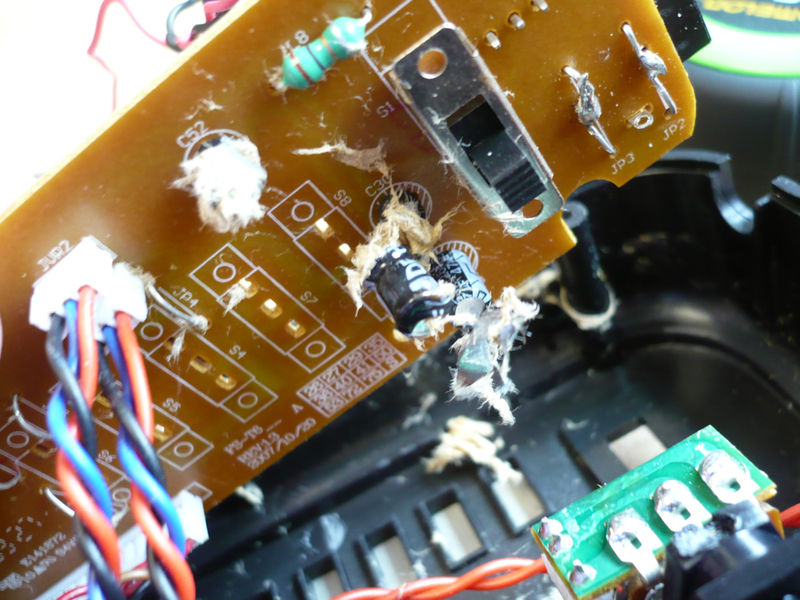 I yanked the connectors apart immediately, but then saw all the smoke pouring out of the transmitter case. 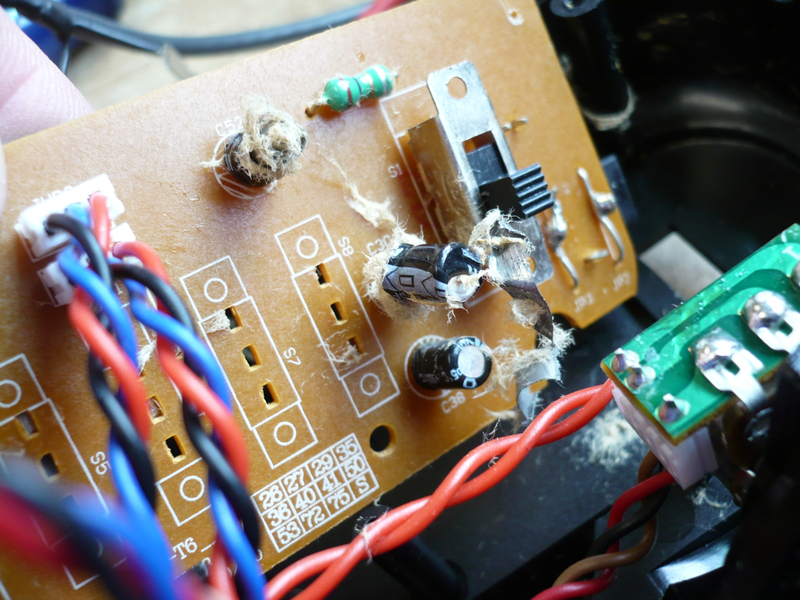 Those used to be capacitors. Now they just smell bad. I don’t know what else likely fried with the incorrect polarity, but hoping against hope I ran to Radio Shack to grab some new capacitors. I’ll solder them in and see what happens. Watch for an update either lauding my resounding success or drowning in my miserable failure.